A familicide is a type of murder or murder-suicide in which a perpetrator kills multiple close family members in quick succession, most often children, relatives, spouse, siblings, or parents. In half the cases, the killer then kills themselves in a murder-suicide. If only the parents are killed, the case may also be referred to as a parricide. Where all members of a family are killed, the crime may be referred to as family annihilation. Familicides were used as an enhanced punishment in antiquity. In ancient China, the "nine familial exterminations" was the killing of an entire extended family or clan, usually for treason. Machiavelli advocated the extermination of a previous ruler's family to prevent uprisings in The Prince. Sippenhaft was used in Nazi Germany to punish and sometimes execute the relatives of defectors and anyone involved in the 20 July plot. La Cosa Nostra began killing the relatives, including women and more recently children, of informants (pentiti) and rivals in the 1980s. It is not incorporated formally into any modern judicial systems, except in North Korea, where whole-family internment at Kaechon internment camp often ends in death. Between 1900 and 2000, there were 909 victims of mass murder in the US (defined as 4 victims within a 24-hour period). Of those, more than half occurred within an immediate family. Although the total number of familicide cases are relatively rare, they are the most common form of mass killings. However, statistical data are difficult to establish due to reporting discrepancies. Familicide differs from other forms of mass murder in that the murderer kills family members or loved ones rather than anonymous people. This has a different psychodynamic and psychiatric significance, but the distinction is not always made. A study of 30 cases in Ohio found that most of the killings were motivated by a parent's desire to stop their children's suffering. According to ABC News contributor and former FBI agent Brad Garrett, people responsible for killing their families tend to be white males in their 30s. Many of these crimes occur in August, before school starts, which may delay detection and investigation. In Australia, a study was done of seven cases of familicide followed by suicide in which marital separation followed by custody and access disputes were identified as an issue. Some common factors such as marital discord, unhappiness, domestic violence, sexual abuse, threats of harm to self or others were found in varying degrees. It was not clear what could be done in terms of prevention. The internal logic for family annihilation can stem from a number of sources. David Wilson of Birmingham City University has divided these cases into four groups: anomic, disappointed, self-righteous and paranoid. In this typology, the anomic killer sees his family purely as a status symbol; when his economic status collapses, he sees them as surplus to requirements. The disappointed killer seeks to punish the family for not living up to his ideals of family life. The self-righteous killer destroys the family to exact revenge upon the mother, in an act that he blames on her. Finally, the paranoid killer kills their family in what they imagine to be an attempt to protect them from something even worse. Watts family homicides, August 13, 2018, Frederick, Colorado; Chris Watts killed his pregnant wife, two daughters and unborn child. Osmington shooting, May 11, 2018, Osmington, Western Australia; seven members of the Miles family (two grandparents, the mother, and four children) were shot dead - police are treating it as a murder-suicide. Van Breda murders, January 27, 2015, Stellenbosch, South Africa. David Crowley, December 2014, Apple Valley, Minnesota; murdered his wife and 5-year-old daughter, then killed himself. Cairns child killings, December 18–19, 2014, Cairns, Australia; eight children (seven siblings and one cousin) were drugged and then stabbed to death by the mother - she was found not guilty by reason of insanity. Dupont de Ligonnès murders and disappearance - The wife and four children of Xavier Dupont de Ligonnès were found murdered and buried at the family home in Nantes, France. Xavier, the only suspect, disappeared and has never been found. William Parente, April 19–20, 2009, killed his wife, two daughters, and himself. Steven Sueppel, March 23 or March 24, 2008, killed his wife, four children, and himself. Chris Benoit, June 22–24, 2007, killed his wife, son, and himself. Marcus Delon Wesson, March 12, 2004, killed nine of his children/wives that he fathered through his legal wife and his polygamist wives who were also his daughters and nieces. Christian Longo, December 18, 2001, killed his wife and three children. Fled to Mexico, captured and now on death row in Oregon. Dipendra Bir Bikram Shah, June 1, 2001, allegedly killed the royal family of Nepal at a family dinner and died from a self-inflicted gunshot to the head. Mark Lundy, 29 August 2000, checked into a hotel in Petone, North Wellington, on a regular business trip from Palmerston North, and allegedly drove back up to his home town at great speed, setting a record, to murder his wife and daughter for the life insurance money he needed to pay off the $NZD 2 million he was in debt. Robert William Fisher, April 10, 2001, wanted for murder of his wife and their two children in Scottsdale, Arizona; has been charged with three counts of first-degree murder and one count of arson of an occupied structure; currently on the FBI Ten Most Wanted Fugitives list. Phillip Austin, July 10, 2000, murdered his wife, two children, and the family's two dogs in a series of violent attacks. Kip Kinkel, May 20, 1998, killed his parents before committing a school shooting, leaving two additional dead and 25 wounded. Bain Family murders - On the morning of 20 June, 1994, 22-year-old David Bain, of a notably bizarre family living in Andersons Bay, Dunedin, rang 111 in great distress, saying "they're all dead, they're all dead". Police made it to the dilapidated, dirty and unsettling house, where his mother, sisters and brother had been shot in their bedrooms, with his father's body lying in the living room floor, having apparently shot himself in the head with the family rabbit gun, after apparently murdering his family early that winter morning while David was on his paper round, leaving a note on the computer stating "sorry, you were the only one who deserved to stay". Much of the evidence pointed towards David, who was convicted of the murders the next year, but a retrial in 2009 funded by a former All Black got him acquitted with a large sum of money that could not be legally called compensation. Charles Stuart, October 23, 1989, killed pregnant wife and blamed it on imaginary black hijacker; seven-month-old fetus delivered alive but died in 17 days; committed suicide less than three months after murders. József Barsi, July 25-27, 1988, killed his daughter, actress Judith Barsi, and his wife before lighting their bodies on fire and shooting himself. Ronald Gene Simmons, from December 22, 1987, to December 28, 1987, killed 14 family members ranging in age from 20 months to 46. Bradford Bishop, 1976, killed his three children, mother, and his wife. James Ruppert, March 30, 1975, Easter Sunday, killed 11 family members in his mother's house in Hamilton, Ohio. Ronald DeFeo, Jr., November 13, 1974, killed his father, mother, two brothers, and two sisters. John List, November 9, 1971, killed his wife, mother, and three children in their home in Westfield, New Jersey, and then disappeared. A fugitive from justice for nearly 18 years, List was finally apprehended on June 1, 1989, after the story of his murders was broadcast on the television program America's Most Wanted. Jeffrey MacDonald, February 17, 1970, convicted of killing his wife and two preschool daughters. Charles Whitman, August 1, 1966, killed his wife and mother before committing the University of Texas at Austin campus spree shooting, killing 16 people and wounding 32 others. He was shot and killed by Austin police officer Houston McCoy. Magda Goebbels and her husband Joseph, Minister of Propaganda of Nazi Germany and briefly Chancellor of Germany, on May 1, 1945, fatally poisoned their six children before committing suicide together. Harald Quandt, Magda's son from a previous marriage, was the only member of the family to survive. Marty Bergen, January 19, 1900, killed his wife and children with an ax, then slit his own throat. George Forster, allegedly killed his wife and child by drowning them in Paddington Canal, London; later hanged at Newgate on 18 January 1803. Girls & Boys, a one-woman play by Dennis Kelly which premiered at the Royal Court in 2018. Rates of individual homicide involving family members, not grouped by incidents of familicide, in the United States between 1980 and 2010. Deith, Jane (March 6, 2012). "What drives a man to kill himself and his family?". BBC News. "Tragic cases of 'family annihilation' in the UK". Evening Standard. August 24, 2012. Hannah, Sophie (February 6, 2010). "What drives a father to destroy his family?". Daily Mail. Pemberton, Max (December 17, 2011). "What drives a father to kill?". The Daily Telegraph. Harrison, Louise (August 2, 2010). "Family Annihilation: Debt, Depression and the Fragile Family". Counterfire. ^ Liem, Marieke; Levin, Jack; Holland, Curtis; Fox, James A. (1 May 2013). 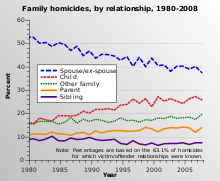 "The Nature and Prevalence of Familicide in the United States, 2000–2009". Journal of Family Violence. 28 (4): 351–358. doi:10.1007/s10896-013-9504-2. ISSN 0885-7482. ^ Websdale, Neil (2008). "Familicide". Encyclopedia of Interpersonal Violence. SAGE Publications, Inc.: 238–238. doi:10.4135/9781412963923.n161. ^ Wilson, Margo; Daly, Martin; Daniele, Antonletta (1995). "Familicide: The Killing of Spouse and Children" (PDF). Aggressive Behavior. 21: 275–291. doi:10.1002/1098-2337(1995)21:4<275::aid-ab2480210404>3.0.co;2-s. Archived from the original (PDF) on 2007-09-26. ^ Scheinin, Lisa; Rogers, Christopher B.; Sathyavagiswaran, Lakshmanan. "Familicide—Suicide". The American Journal of Forensic Medicine and Pathology. 32 (4): 327–330. doi:10.1097/paf.0b013e31821a555a. ^ Sachmann, Mark; Harris Johnson, Carolyn Mary (1 March 2014). "The Relevance of Long-Term Antecedents in Assessing the Risk of Familicide-Suicide Following Separation". Child Abuse Review. 23 (2): 130–141. doi:10.1002/car.2317. ISSN 1099-0852. ^ Machiavelli, Niccolò (1532). The Prince. chap. 4. Retrieved 2017-04-26. ^ Loeffel, Robert (February 2007). "Sippenhaft, Terror and Fear in Nazi Germany: Examining One Facet of Terror in the Aftermath of the Plot of 20 July 1944" (PDF). Contemporary European History. Cambridge University Press. 16 (1): 51–69. doi:10.1017/S0960777306003626. Retrieved 2017-04-27. ^ Bohlen, Celestine (October 11, 1995). "As Code of Silence Cracks, Mafia Changes Rules". The New York Times. Retrieved 2017-04-27. ^ Parry, Tom (April 12, 2014). "Children murdered by the Mafia as Italian mobsters sink to new low". Mirror Online. Retrieved 2017-04-27. ^ "Prison Camps of North Korea - Camp 14 Kaechon". HumanRights.gov. Retrieved 2017-04-27. ^ Emily Shapiro (21 August 2018). "When people kill close relatives: Explaining 'family annihilators'". ABC News. ABC News Internet Ventures. ^ Melissa Hogenboom (15 August 2013). "Criminologists identify family killer characteristics". BBC News. ^ Cooper, Alexia D.; Smith, Erica L. (2011-11-16). Homicide Trends in the United States, 1980-2008 (Report). Bureau of Justice Statistics. p. 11. NCJ 236018. Archived from the original on 2018-03-30. Look up familicide in Wiktionary, the free dictionary. Skipp, Catharine (Feb 11, 2010). "Inside the Minds of Family Annihilators". Newsweek. This page was last edited on 22 March 2019, at 19:24 (UTC).